One day a couple of years ago, a flat-bed truck rolled onto the Museum of Aviation grounds near Warner Robins, Ga., with a weathered old North American F-100 Super Sabre jet strapped to the back. A man saluted as he fought back a wave of emotions. That man was retired Air Force Maj. Gen. Rick Goddard, former commander of the Warner Robins Air Logistics Center. He flew the fighter on 180 combat missions in Vietnam, including one in which he was awarded the Silver Star. It was the first time he had seen the plane since he left Vietnam in 1969. Budget cuts have delayed restoration of the plane, but the museum expects to start on it full force early this year. The project will be a major effort for the museum’s restoration team and is expected to take about a year to complete. 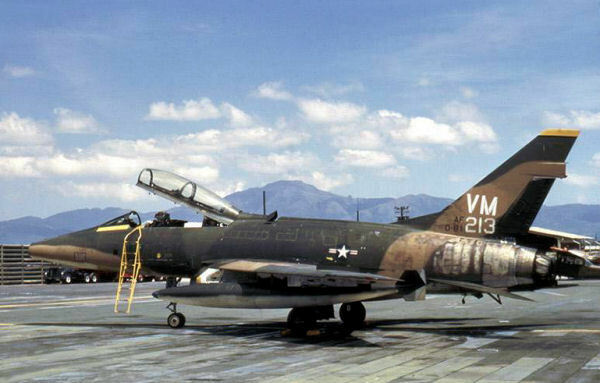 The plane will be displayed in Hangar One, which is dedicated to the Vietnam War. For the complete story by Wayne Crenshaw of The (Macon, Ga.) Telegraph, click here.